You can customize your storefront by displaying your own domain name in the web browser address bar. For example, your storefront URL can display as www.coolexample.com instead of the default secureserver.net URL. Note: For security purposes, we limit this feature to certain pages of your storefront. When customers enter secure areas of your storefront, the default URL displays instead of your custom domain. 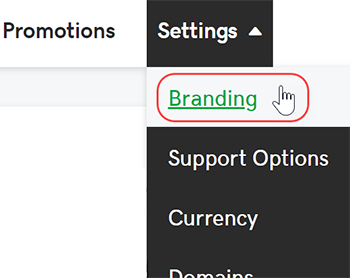 From the Settings menu, select Branding. In the Custom Domain section, select Yes, use a custom domain for my homepage and enter your domain name in the Site field. Note: If you are using the Reseller Plugin for your storefront, we recommend setting up a custom domain using a different subdomain, such as shop.coolexample.com or store.coolexample.com . This will allow your storefront to continue showing your unique branding to your customers. If the domain name you entered is registered in the same account and using our nameservers, we will automatically update DNS for you. To use a domain name registered elsewhere, select I manage my DNS, and follow the steps provided. Note: It can take up to 48 hours for your DNS changes to take full effect. Customize your storefront with the built-in options or the WordPress plugin. Edit the product offerings available to your customers.